CONSELF | Mechanical model in FEM analysis: what should I choose? Home > FEA / Finite Element Analysis > Mechanical model in FEM analysis: what should I choose? 26 Jul Mechanical model in FEM analysis: what should I choose? One of the major and most important choice we have to make when running a FEA (Finite Element Analysis) regards the material model, also called mechanical mode. What is that? It’s relatively easy to explain! As we know, every material reacts somehow when an external load is imposed. Obviously this reaction depends on many parameters, but it has been agreed a unified traction test from which it is possible to extract a relation between the stress (force acting inside the material) and shear (deformation imposed to the material by the external force). In a general meal material it is possible to have a relation graph such as the following one. 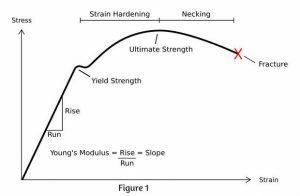 In this graph, as one may expect, it is possible to define at least two zone of the curve: before the Yield Strength and after it. 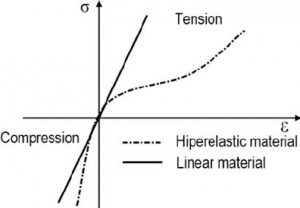 Before Yield, in fact, the relation between shear and stress is actually linear, giving a linear elastic material, after it we have a non linearity zone also know as plastic material. With very little effort we have introduced already two types of material model available in any standard FEM solver. Obviously these two models are limited to metals. 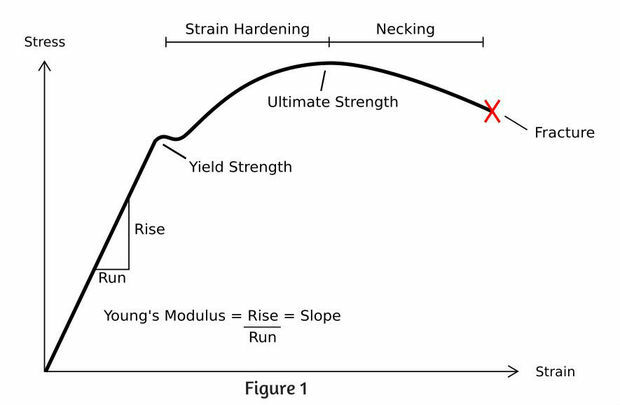 If we consider plastics or rubbers the relation between shear and stress becomes different: no more linear relation, but a relation with a continuous variation of the curve slope. Here you are the hyperelastic model, another model usually available in standard FEM solvers. It is important to note that all these models, except the linear elastic one, introduce a certain grade of non linearity in the FEM analysis performed. The solver, to achieve a complete convergence, requires an iterative process to calculate the solution, so a number of iteration greater than one must be assigned in case we activate any of these models. Once we have discovered these non-linear relation due to the material it is now the moment to introduce another sort of non linearity, this time due to the geometry. In FEA is really relevant the total amount of displacement which the external load induces to the system. If the final displacement is not negligible (i.e. the load deformed shape is distant from the non-deformed shape) another non linearity is introduced: the large displacements/rotation. In modern FEM solvers this is just an option to be activated, option that like the previous ones needs an iterative process to calculate the results. As a first try we can neglect the large displacement/rotation hypothesis and see the results. When we see the results it is possible to check if the deformed shape overlaps or not to the original shape of the body we are simulating. If it does’n we already know another simulation with this option enabled is required!